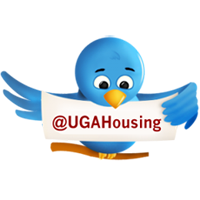 This year, University Housing held a social media contest for incoming first-year residents. The reward was sweet – the chance to pick a room in one of three popular residence halls on campus: Myers Hall, Creswell Hall, or Building 1516. Why are these residence halls so popular? Myers Hall is the magnet residence hall for the University of Georgia Honors Program. This beautifully renovated hall is home to 250 first-year Honors students, affording them the opportunity to live and study in a learning community of like-minded peers. Built in 1953 as an all-women community, Myers Hall is perhaps best known as the home of Charlayne Hunter-Gault, the first African American to attend UGA in 1961. Conveniently located next to the volleyball pit and Bolton Dining Commons, Creswell Hall is home to Franklin College of Arts and Sciences Academic Advising and the Creswell Learning Communities, where in-depth faculty involvement nurtures exceptional academic growth. Named after Mary Ethel Creswell, the first woman to receive a degree from the University of Georgia, Creswell Community is home to 965 male and female first-year students. Building 1516, the newest residence hall on the UGA campus that opened fall 2010, provides double and single rooms with private bath accommodations geared toward non-first-year, undergraduate students. Building 1516 is our first LEED gold-certified residence hall featuring healthy, eco-friendly furnishings, increased levels of fresh air, Energy Star® qualified products, a rainwater catchment system for water recycling and a number of other sustainable design features. After four weeks of sharing our posts with friends and followers, we randomly selected one male and female winner from our pool of nearly 1,000 entries. Congratulations to our winners! What residence hall did you choose? Why did you choose that hall? My roommate (Bethanne) and I have taken a lot into consideration while choosing where we want to live next year. We have decided to go with the Myers Halls because of its location and size. Also, the fact that it is an honors building is a plus. I feel that it will be a great fit for us. What made you decide to come to the University of Georgia? My brother graduated from UGA in December 2011, so I have been familiar with the school for several years now. I love the historical background of the school, and I know that UGA will open up many opportunities for me in the future. I wanted to go to a school that focuses and prides itself on its academics, while providing a fun living environment for the students. What one item will you bring from home that you just can’t live without? It may sound childish, but I would have to say my stuffed animal, Doggy. I have had her since I was born, so she is special to me and will give me some comfort of home. I chose Building 1516 due to it being brand new and having suite-style bathrooms. I also hear the rooms are a little bigger than a normal room. I was born in Georgia and I've been a Bulldog all of my life. I've been going to Georgia football games since I was 7, and I fell in love every since the first time I visited Athens. My guitar. I'm currently learning how to play guitar, and I enjoy spending time practicing and learning new things about playing the guitar.